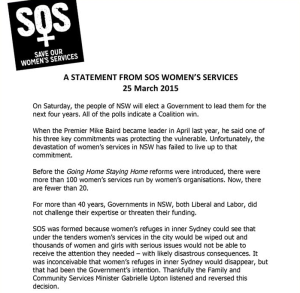 As more evidence emerges of crises in women’s refuges around NSW, campaigning group Save Our Women’s Services (SOS) has called for an independent inquiry. “When the Premier Mike Baird became leader in April last year, he said one of his three key commitments was protecting the vulnerable. Unfortunately, the devastation of women’s services in NSW has failed to live up to that commitment,” SOS said. After the LNP government announced its ‘Going Home Staying Home’ policy in 2012 women’s refuges, including those that had operated successfully for years, were required to tender for funds to deliver their services. The result was that many refuges were handed over from feminist or community control to faith-based organisations. “Faith-based organisations do a lot of important work but women’s refuges were set up separately from church-based organisations more than 40 years ago to provide choice in the system, and gendered expertise,” SOS said. A Parliamentary Inquiry to be held into the impact of Going Home Staying Home on women and children. All refuges to be funded appropriately to have a mandatory staff member on site or on call 24/7. Youth refuges and Service Support Fund Services to receive the funding necessary to cover their operating costs, ie. Indexation and mandatory Award pay increases. Contracts to be extended to five years instead of three. Community services should not be put out to competitive tender in future. An except from the Save our Services election statement released on March 25. The SOS demands come following last week's coverage of Mid North Coast refuges, as well as a number of other media reports, including an ABC Background Briefing documentary that focussed on refuges in Broken Hill and Mildura, and a report in the Sydney Morning Herald about concerns at the Dubbo refuge. Earlier this month, the Salvation Army was forced to make a public apology after the male manager at the Broken Hill refuge said women should not “use and abuse” refuges. Despite refuges existing to provide safe housing for women fleeing domestic violence the Salvation Army has imposed stricter guidelines for women who access the Broken Hill centre in an effort to absorb recent funding cuts, forcing them to pay for their stay or not return. The male operator of the refuge in Dubbo was allowing general homeless women – who often experience drug problems or have mental health issues – to stay in the refuge with women and young children escaping domestic violence. According to SOS, in one incident, a woman and child were forced to lock themselves in their room out of fear of another resident. The manager also recently installed cameras inside the refuge to monitor women and children. Women have often experienced control and surveillance by their partners and should not be subjected to this unacceptable intrusion. The cases of misconduct, it appears, are widespread. Due to inappropriate supervision of children at the refuge a resident was unable to use the toilet because the children of another resident had blocked it. She was left to fix this situation alone. One of the three full-time staff members has resigned, leaving just two staff on the ground in place of five full-time and a number of part time staff under the old management. The Dunghutti worker due to start has not, and the position has been re-advertised. This is despite assurances from both the Samaritans and the department that a start date for the Dunghutti Aboriginal caseworker was imminent. The Samaritans are now advertising for two caseworkers for Kempsey. Reports suggest the homelessness advice ‘hub’ is on hold because there are not enough staff to operate it. Reports residents are having to go elsewhere to get photocopying and printing done for rental applications - a service the previous refuge managers would assist with. 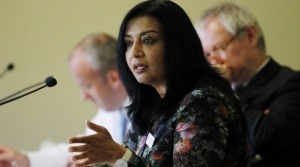 In response to the dire situation at refuges around the state, NSW Greens MP Mehreen Faruqi has backed the SOS demands. “I’ve been visiting women’s services and refuges across NSW and the stories I’ve heard are very similar to the devastation in Taree and Kempsey. 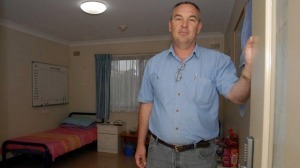 In women’s refuges in Wagga and Lismore staff have left and not been replaced. There’s more pressure on the ones who remain and more and more women are being turned away. “Under this Government’s flawed tendering process, refuges have lost staff with decades of specialist experience. Women and children fleeing domestic and family violence need tailored and specific support services not just a roof over their heads. “The aftermath of this botched program clearly shows a real ignorance for the needs of women facing domestic violence. The government must admit their failings, go back to the drawing board and restore funding to women-only specialist services, refuges and shelters,” Faruqi said. Greens candidate for the seat of Oxley, in which Kempsey is one of the biggest towns, Carol Vernon, says the one size fits all approach to running homeless refuges is “abhorrent”. “Every time this topic comes up, many people express disbelief at the flawed tender process and the totally unacceptable outcomes for all women seeking shelter, including of course, the women of Kempsey. “Even the name Going Home Staying Home shows such a lack of understanding when it comes to domestic violence and the needs of women and children,” said Vernon who has been publicly campaigning against the changes last year. Vernon said she’s often found herself emphasising to others that “women seeking shelter are not homeless” - despite the Baird government’s changes that have placed women escaping domestic violence into the same category as women experiencing homelessness, for drug or other financial reasons. “What was happening in Kempsey was so beautifully tailored for the needs of the community. It was so valued by the whole community,” Vernon said. “There was a very good service for men who needed to address their violence issues, and that’s also lost funding. The whole thing was dovetailing, the services... were all working together very well. It was best practice, then the manner in which [the reforms] were done was appalling, the whole process totally and utterly flawed,” Vernon said. The seat of Oxley has been held by the Country / National Party since the Second World War (except for two terms in the early 1960s after sitting MP Les Jordan defected to the Liberal Party). Sitting MP Andrew Stoner, who was Deputy Premier for most of the last term of government, has retired and will likely be replaced by Melissa Pavey on Saturday. “I fear that the people of Oxley, particularly the women, will not benefit from any outcome that delivers the same blinkered approach we have known for years,” Vernon said. Labor candidate Fran Armitage labelled the government’s changes as “disgusting”. Armitage said she has been in liaison with the Shadow Minister for Family and Community Services to discuss options to improve the current situation at the Kempsey refuge. “Labor has announced a lot of funding leading up to the election, which I will be making them account for and giving to Kempsey”, Armitage said. In addition to holding Labor’s funding promises to account and directing funding towards fixing the mistakes that have been made at the Kempsey Women’s Refuge, Armitage has promised to improve the way to court system deals with offenders and introduce a new program to help rehabilitate violent men. Both the Greens and Labor have promised extra money for women’s shelters. Nationals candidate Melinda Pavey (who is currently a member of the NSW upper house) said while she appreciates concern raised about changes to management of community services, improving services was the catalyst for the Going Home Staying Home reforms. Others don’t agree, including the service provider themselves. As reported earlier this week, a Samaritans staff member said that as a result of the government’s poor reform process, “skill sets are now not in the pace that they’re needed”. “Every week on average, one women in Australia is killed by a current or former partner. Already for 2015, it’s up to two a week. “The NSW Government could not have chosen a worse time to introduce these reforms,” SOS said. Despite a request for information on any plans Pavey has to increase support for women and children escaping domestic violence in the Kempsey area, Pavey’s response failed to include the term “domestic violence” and made one inconsequential mention of “women”. If re-elected, the LNP have agreed to appoint a Minister for Family and Domestic Violence. A positive initiative, but begs the question: will a top line Minister achieve anything without front line services to provide safe accommodation and specialist domestic violence support? The Samaritans of Newcastle have been contacted for comment. In 2013, the NSW government changed the way it funds homelessness services, including women's refuges. What was the impact of these changes? This story is based on a speech for Students for Women's Only Services vigil 'Stop Killing Women' held on May 25 at UTS.